Robinson’s Shoemakers has been a family-run business since 1954, and has stayed local to its roots in Carrickfergus (Northern Ireland) since the beginning. Now a third-generation family business, the company continues to grow from strength to strength by offering expertise in all things shoe related, not just locally but extended to over 100 countries around the world. Making sure customers find properly fitting footwear is what the dedicated employees at the company live for, so only the best, handcrafted shoes, made with the highest quality materials, are stocked. Brands sold include Loake, Barker, Alfred Sargent and Anatomic as well as the Robinson’s own brand of high-quality footwear. 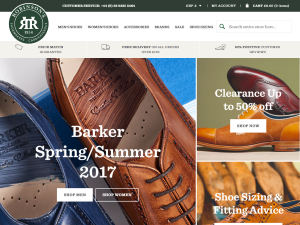 The full range of shoes, shoe care and apparel can be found on Robinson’s website. Each season also brings new lines and additions to the range, and this is always eagerly anticipated by the devoted customer base Robinson’s has amassed over the past 60 years in business. Robinson’s Shoemakers offer free worldwide delivery on orders over £150, and free delivery on all orders in the UK. Orders are normally dispatched within two working days and delivery is fulfilled by either Royal Mail or FedEx. All orders also benefit from a free pair of socks, to make wearing brand new shoes even more special. Loyal customers can also earn reward points with every purchase – with opportunities to earn bonus points too – that can be spent on any product online.